Guess what? 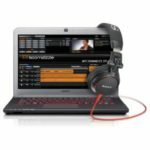 There is a super solid deal out there, DealFisher.com now promotes the Sony VAIO SVL24125CXB L Series Touchscreen All-in-One w/ Intel Core i5 2.5GHz, 8GB DDR3, 2TB HDD, Windows 8 for only $749.99 + free shipping! This is definitely the best price we could find for this computer, the next best available price is $1,199 from Microsoft Store, we save roughly $450 compare to that, so you can't say it's not a great deal. 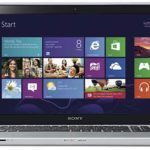 The Sony VAIO SVL24125CXB L Series Touchscreen computer highlights an Intel Core i5-3210M 2.5GHz 64 bit Dual Core Processor, 8 GB DDR3 1600 MHz memory, 2 TB SATA CoolSpin hard drive, a 24.0 in Full HD LED-backlit touchscreen (1920 x 1080) w/ 10-finger multi-touch support, and Intel HD Graphics 4000 with shared graphics memory. The Sony VAIO SVL24125CXB also comes with 2-in-1 media card reader (SD/MS), Intel High Definition Audio with S-FORCE Front Surround 3D powered by S-MASTER, 1.3 MP HD webcam, 802.11b/g/n WiFi, and Slot-loading CD/DVD player/burner. External ports include: 3 USB 3.0 • 3 USB 2.0 (2 regular, 1 with Sleep and Charge) • HDMI in/out • TV tuner • Headphone output • Microphone input • RJ-45 (10/100/1000). 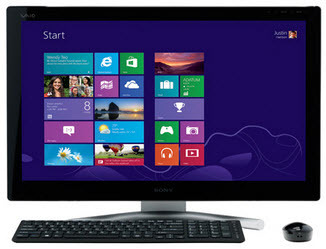 The computer is preinstalled with Windows 8 operating system. You see, this is a very well-configured all-in-one computer, people will be crazy about it. So if you are looking for a decent all-in-one computer for home use, I think this Sony VAIO L series touchscreen could be a killer now. What do you say?